A Toyota 8FG 1.8-tonne counterbalance forklift is the latest machine to be used in the warehousing and logistics training courses offered by Sydney-based Tag Training. Tag Training business manager Trent Ruddiman (right) at the company's training facility in St Marys, Sydney. The 8FG is the first Toyota materials handler the company has bought. It joins a Toyota 7FBE 1.5-tonne counterbalance forklift and a BT OSE250 electric pallet jack on long-term loan, with a Raymond 5200 order picker arriving shortly. Tag Training says its aim is to eventually run an all-Toyota fleet at its training facilities in western Sydney and south-east Brisbane. It also conducts training for clients at their own premises. Business manager Trent Ruddiman says the decision to change to Toyota Material Handling Australia (TMHA) supplied equipment was largely due to the ease of operation and his past experience with the product within the industry. 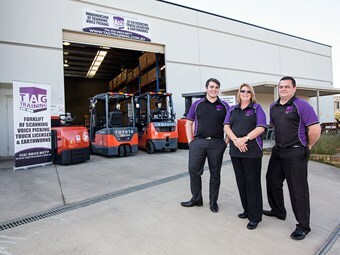 "I operated Toyota forklifts for many years when I worked in distribution centres and always found them to be very well built and reliable," Ruddiman says. "In my current role I believe they're the best machines for our clients to learn on: they're much easier and more intuitive to use than most other brands I've come across. "The safety features are also great for us, like the OPS (Operator Presence Sensing system) that can sense if the operator isn't in the usual travelling position and cuts off power." Other Toyota 8-Series forklift features that swayed Tag’s choice include a height selector for simplified load handling, a shock sensor that detects and sends a warning of an imminent collision, and a PIN code entry system that prevents unauthorised people from operating the forklift. Ruddiman says that the Toyota machines’ durability is also a plus because, while forklifts in the training environment aren't worked as hard as they might be on the job, "they are used consistently, and by inexperienced operators." TMHA area sales manager Corey Denford says the application of the Toyota forklifts in a training environment is an example of the range of purposes the Toyota forklift equipment is suited to. "It's great to see Toyota forklifts delivering in the training environment," he says, "and it's pleasing to hear that the simplicity of layout and ease of operation is a big plus for those learning how to operate the equipment." Click here to find Toyota combustion counterbalanced forklifts for sale. 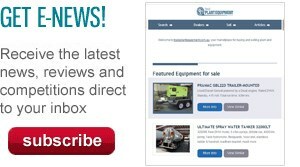 Click here to look up combustion counterbalanced forklift specifications.